The Nest is a Sci-Fi adventure set in the universe of Brave Halfling Games' X-Plorer OSR ruleset/setting. The adventure is 6 pages long from cover to OGL and the adventure itself consists of 2 pages. 1 page for the adventure itself and another page for the map. 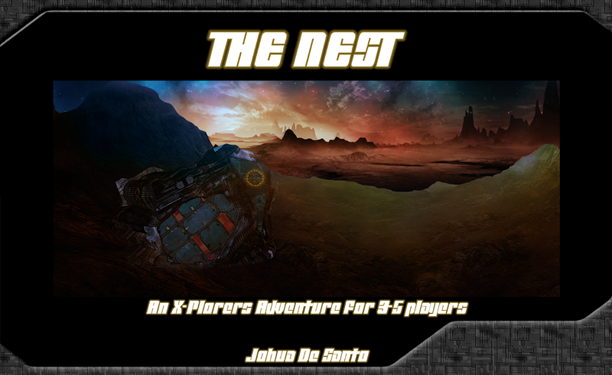 The Nest is meant for low level play and to be a quick and fun romp through the X-Plorers system and through OSR Sci-Fi play. Please take a look and if your interested pick it on up! A waste management facility on a rim-system planetoid has suddenly gone dark. You and your team have been contacted by the Nostromo Waste and Salvage Management to investigate. Not everything, however, is how it seems. Danger and death await.